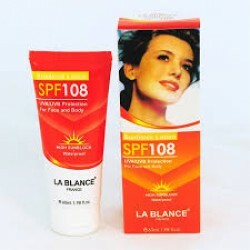 This is ne formulation desined for sun protection. It is non-greasy, waterproof and silky feeling with natural moisturizing and the latest Micro titanium dioxide and patented solarease it to protect the sin against UVA and UVB rays-one of the main causes of dark spots. It helps in the reinforces your skin's outer layer against harmful UV rays. It also contains Algae extract to nourish and refine your Skin. * Help prevent premature wskin aging from the sun. * Broad-spectrum UVA/UVB protection with Avobenzone. Ingredient: Vitamin A Vitamin B Oxygen supply plus Vegetal Extract, fragrance and other. Direction: Apply liberally and repeat if necessary over the face and body. Avoid contact with eyes and stop using if skin inritation develop.